In total, our community needs to raise approximately $19.5 million through individual, corporate and government contributions to build the multi-use facility and new arena. Of this amount, the Town of Niverville has contributed $5 million which will be donated without raising taxes. This money is coming from the General Reserve and Recreation Levy. The recreation facility levy has been cancelled and replaced with a general borrowing levy named the Community Resource & Recreation Centre Levy, specific to raising the $5 million. On September 6, 2016 Council passed the borrowing motion. 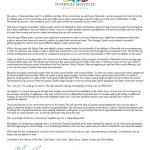 With this $5 million kick-start from the Town of Niverville, we are hopeful that the entire community and other levels of government will embrace the remaining fundraising goal of $14.5 million by giving generously to this important project. Every donation, large and small, will help us provide a year-round facility for all ages, today and into the future. Please Become a Friend of the CRRC TODAY! Or visit Town Office at 86 Main Street between 9 & 5 Monday to Friday. 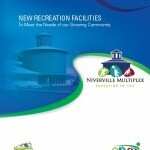 Cheques can be made out to Town of Niverville, referencing Community Resource & Recreation Centre. All donations greater than $20 are eligible for a tax receipt. OR, if your business, foundation, church or organization would like a presentation from our fundraising team, please contact us.